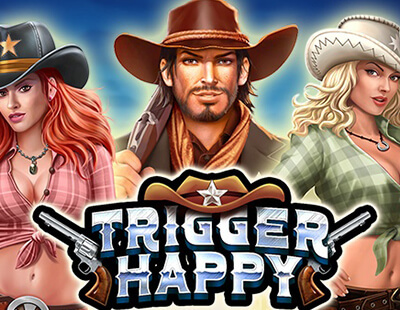 Springbok Casino launches the Trigger Happy slot game, bringing cowboys and cowgirls to your slots screen. The Trigger Happy slot game takes us back to the Wild Wild West with a sheriff, free spins, and more. The new slot game launches on Wednesday, March 20th, 2019. Trigger Happy joins a number of top quality slot releases at Springbok Casino so far this year. After a number of Oriental themed Realtime Gaming (RTG) slots, a trip to the Wild West is a welcome change. Trigger Happy, played on five reels with three rows, has 30 fixed pay lines. Symbols pay left to right, although scatters pay no matter where they land on the reels. There are two wilds in the game. The two cowgirls drive the reels wild! Find the redhead cowgirl on the first two reels, and the blonde on the last two reels. Each cowgirl wild symbol replaces all symbols other than the scatters. The sheriff badge scatter symbol triggers the main bonus feature. Three or more sheriff badge scatters set off the Trigger Happy free spins round. There are two types of free spins rounds. You choose either the Blonde Cowgirl feature or the Redhead Cowgirl feature. Pick the blonde, and she will cover the entire fifth reel. This lasts for the duration of the free spins. She can also cover the fourth and fifth reels, throughout the free spins round. The redhead cowgirl either covers the first reel or acts as a scatter symbol during the free spins round. Scatters trigger seven free spins. In addition to free spins and wild substitutes, the game offers other special features. Keep an eye open for the Lucky Feature. This randomly triggered feature appears anytime during gameplay. It can trigger the Trigger Happy free spins feature or the Lucky Free Games. Lucky Free Games come with between five and 10 free spins. In case this game doesn’t sound good enough, read on! One thing slots players love is a progressive jackpot game. The game includes two progressive jackpots, the Minor and the Major jackpot. The Minor jackpot resets to $250, approximately R3,450, after someone hits it. The Major jackpot begins at $1,000, approximately R13,800. Daniel van Wyck, the Springbok Casino Manager, commented on the new slot game. He said: "Here at Springbok Casino, we love Wild West themed slots, and Trigger Happy is one of the most exciting and thrilling we have ever seen. The game packs a punch with a huge range of bonus features, and a progressive jackpot for big wins."